‘Race-Blu’ livery also available on YZF-R series production bikes for 2013! The MotoGP bikes’ new design has been created to reinforce Yamaha’s historic association with racing blue, harking back to the racing liveries of the early 1980’s Yamaha teams. Alongside the two-tone blue and matt grey colour scheme, the Yamaha YZR-M1 will also feature matching blue wheels. 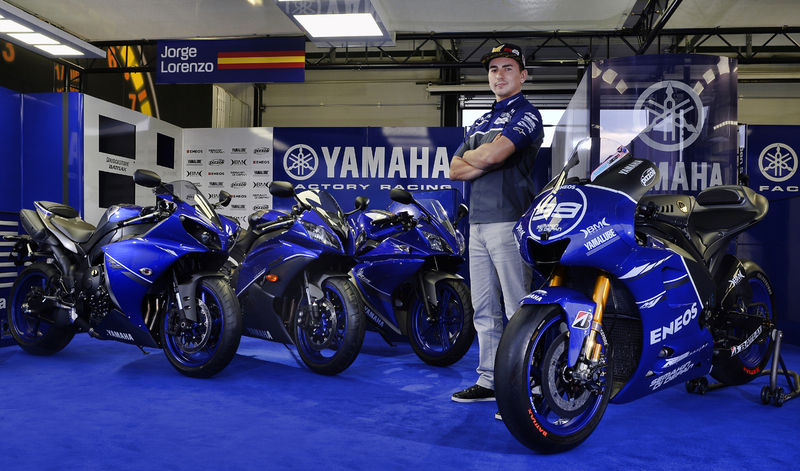 Riders Jorge Lorenzo and Ben Spies will also wear special leathers with the ‘Race-Blu’ colour scheme to complement the bike. The Yamaha YZF-R1, YZF-R6 and YZF-R125 unveiled today in Misano will be the first production models to feature the new livery for the 2013 model year. These exclusive ‘Race-Blu’ Series models will feature as an integral part of the Yamaha line-up in future years. This will be the first time a Yamaha special livery used in Grand Prix racing will be available at the same time for consumers to buy on production motorcycles.